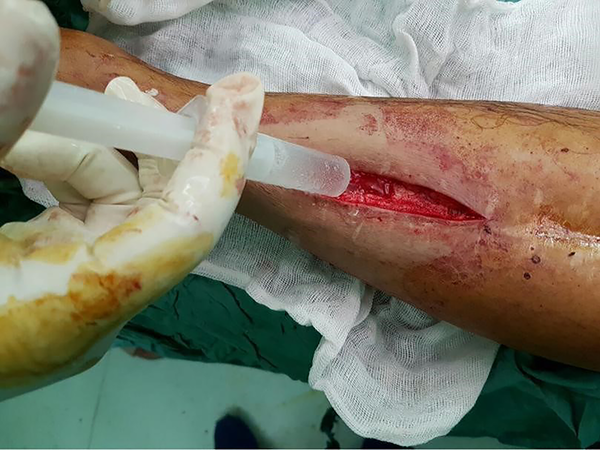 To Cite: Abedi M, Karimi A, Ghaffari S , Izanloo A, Mirkazemi M. Bone Hydatid Disease with Long Term Follow-Up: A Case Report, Arch Clin Infect Dis. Online ahead of Print ; 13(6):e57823. doi: 10.5812/archcid.57823. Introduction: Hydatid cysts of bones may develop in any part of the body, however, they are usually found in the liver and lungs. The primary localization of the cysts in bone is not common. Case Presentation: In this paper, we report the case of a 58-year-old man who was admitted complaining of leg pain. He had undergone hydatid cyst surgery several times over the past years. Conclusions: The patient had surgical removal of the hydatid cyst along with chemotherapy before and after surgery. The patient did not report any problem in a two-year follow-up after his last surgery. Human echinococcosis is a zoonotic infection caused by larval cyst of the dog tapeworm Echinococcus granulosus (E. granulosus), which mainly affects the liver and lungs. The parasite appears in two forms, E. granulosus and E. multilocularis. The former often chooses humans, sheep, and cattle as the intermediate host. A dog is the most common definitive host that transmits this larva to humans through direct contact (1). In endemic areas such as the Middle East, Central Asia, South America, East Africa, and Turkey, hydatidosis is relatively common, particularly in areas of poor hygiene (2). In 75% of all cases, larvae are found in the liver and in 5% of cases, they reside in lungs, with 10% of cases involving other organs. Bone hydatid disease is extremely rare, approximately in 0.5% to 2.5% of all human hydatidosis (3). Tibia involvement is observed in up to 10% of all bone cases. Due to its unusual presentation, its diagnosis may be easily missed, unless meticulous attention is paid to its diagnosis (4). Although long term survival is possible, the disease cannot be easily eradicated and may be resistance to treatment (5). Since patients usually refer at an advanced stage of the disease, treatment is difficult and recurrence is common (6). We report a case of recurrent hydatidosis disease of the tibia in a 58-year-old man with long term follow-up. We presented the case of a 58 year old man suffering from pain in his left leg. In this case, he used to keep animals such as sheeps and dogs at his house. 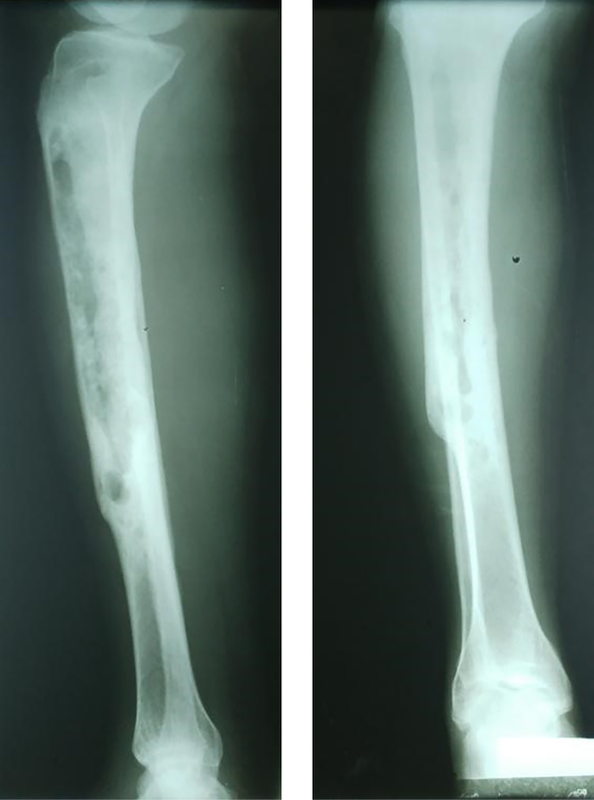 In addition, two and six years ago, the results of radiography had showed cystic lesions in the left tibia (Figures 1 and 2). He had two operations for treating hydatid disease caused by Echinococcus granolosus. In another hospital, he had been treated by adjuvant therapy with albendazole in the same region. In that case, pathological results confirmed the hydatid cyst. Once again, he referred complaining of leg pain and the X-ray of his paining leg showed a lucent and multilocular lesion (Figure 3). The clinical examination revealed a normal range of motion in both knees without local swelling. In the primary evaluation of the patient, white blood cell count (WBC), differential count, and erythrocyte sedimentation rate (ESR) were normal. The patient’s lung and liver were also screened and his abdominal ultrasonography and chest radiography were normal. Chemotherapy with albendazole 400 mg (once a day) was performed 4 weeks prior to the surgery. He underwent surgery during which hydatid suspicious cysts were found (It was fertile). Thus, curettage was administered and the wound was cleaned with solution hydrogen proxide (H2O2) to prevent the recurrence of the cyst (Figure 4). One month after operation, chemotherapy with albendazole was prescribed. The patient recovered without any side effect and was discharged three days after the operation. The patient did not report any major problem in a two-year follow-up after the last surgery. Hydatidosis is an endemic disease in different parts of the world. The most commonly affected organs in humans are the liver and lungs. However, there are some rare cases of bone hydatidosis that accounts for 0.5% to 2.5% of total cases, as most larvae are trapped by the liver and lung upon the release of embryo in the portal circulation. It commonly occurs in the spine (35%) and pelvis (21%), however, long bone involvement of the femur (16%) and tibia (10%) are less common (4). The skeletal infestation of E. granulosus cyst is caused by hematogenous seeding (7). The initial location of the lesion in long bones is metaphysical or epiphysis, and it may later extend to the diaphysis (8). Diagnosing hydatid bone disease is more challenging as it is usually detected at an advanced stage intraoperatively (4), as in the present case. 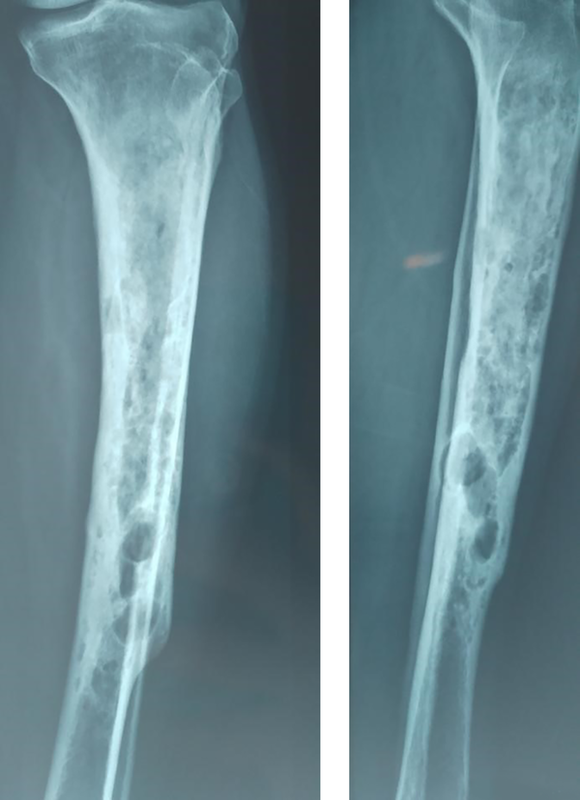 Hydatid disease of bone usually remains asymptomatic over a long period, and it is usually detected after a pathological fracture, secondary infection, or the onset of compressive symptoms on adjacent soft tissues (5). Preoperative diagnosis is primarily made by studying images like X-ray, computed tomography (CT) scans, and magnetic resonance imaging (MRI) (4). Hydatid bone disease should be considered in the differential diagnosis of osteolytic lesions, especially in endemic areas. These include chronic osteomyelitis, fibrous dysplasia of bone, osteosarcoma, and benign cystic lesions. The periosteal reaction, osteosclerosis, and calcification are not specific to hydatid diseases of bones (8). The sero-diagnosis (ELISA and western blot) confirms the diagnosis compared to other cystic locations (liver, lung) where serology can be negative. The principal factor associated with positive serology is the presence or absence of complications (rupture and infection/abscess) caused by the release of parasite antigens (9). Bony hydatid lesions are associated with a 50% rate of local recurrence (10). The recurrence rate is also significant in extraosseous hydatid disease. Haralabidis et al. reported a relapse rate of 11.4% after surgical excision in a group of 70 patients, with recurrences mostly occurring within the first 6 months after chemotherapy. They also reported that after 8.5 years of follow-up, all patients were healthy without any sign of the disease. The recommended treatment for hydatid cysts is a radical surgical excision combined with adjuvant preoperative and postoperative chemotherapy to prevent recurrence (2). Albendazole and mebendazole are two most commonly used antihelminthic drugs. Studies have shown that prolonged albendazole treatment is a safe and effective alternative in late recurrences after bone hydatidosis surgery (1). In our case, we continued oral albendazol (400 mg daily) after the last surgery. This case clearly illustrates the severity and difficulties associated with the treatment of bone hydatidosis. Hydatid disease of bone is a rare disease in the world and osseous hydatidosis represents a highly serious parasitic disease that requires radical surgical excision. Therefore, orthopedic surgeons should be aware of this disease in their diagnosis. The prevention of osseoushy datidosis requires systematic prescription of albendazole both preoperatively and postoperatively, particularly when severalcysts are removed. It is worth noting that a long term follow-up is required in all cases. 1. Gouse M, Amritanand R, Venkatesh K, Sundararaj GD. Recurrent echinococcal infection of the lumbar spine: An 11 year follow-up. Asian Spine J. 2013;7(1):39-43. doi: 10.4184/asj.2013.7.1.39. [PubMed: 23508512]. [PubMed Central: PMC3596583]. 2. Leslé F, Magrino B, Dupouy-Camet J, Sailhan F. Two cases of femoral hydatidosis secondary to canine tapeworm treated by albendazole and prosthetic reconstruction. BMJ case reports. 2013;2013. doi: 10.1136/bcr-2013-009497. [PubMed: 23696145]. [PubMed Central: PMC3669846]. 3. Sapkas GS, Stathakopoulos DP, Babis GC, Tsarouchas JK. Hydatid disease of bones and joints: 8 cases followed for 4 - 16 years. Acta Orthop Scand. 1998;69(1):89-94. [PubMed: 9524526]. 4. Kassa BG, Yeshi MM, Abraha AH, Gebremariam TT. Tibial hydatidosis: A case report. BMC Res Notes. 2014;7:631. doi: 10.1186/1756-0500-7-631. [PubMed: 25208573]. [PubMed Central: PMC4167509]. 5. Khan MS, Hashmi PM, Khan D. Eradication of advanced pelvic hydatid bone disease after limb salvage surgery-5-year follow-up: A case report. J Med Case Reports. 2015;9(1). doi: 10.1186/1752-1947-9-21. [PubMed: 26187499]. [PubMed Central: PMC4506416]. 6. 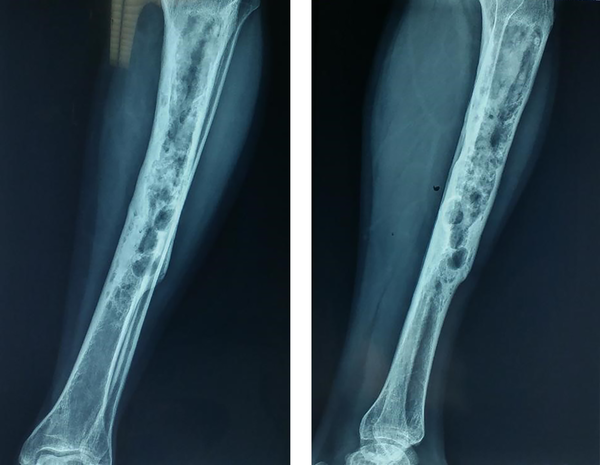 Kalinova K, Proichev V, Stefanova P, Tokmakova K, Poriazova E. Hydatid bone disease: A case report and review of the literature. J Orthop Surg-Hong K. 2005;13(3):323-5. doi: 10.1177/230949900501300321. [PubMed: 16365502]. 7. Emami MJ, Vosoughi AR, Vadiee I, Pakbaz S, Liaghat S. Primary hydatid disease of the ilium: A case report. Iran Red Crescent Med J. 2010;12(2):190. 8. Metanat M, Sharifi-mood B, Sandoghi M, Alavi-Naini R. Osseous hydatid disease. Iran J Parasitol. 2008;3(4):60-4. 9. Santivanez SJ, Sotomayor AE, Gonzalez AE, Vasquez JC, Gilman RH, Somocurcio JG, et al. Absence of brain involvement and factors related to positive serology in a prospective series of 61 cases with pulmonary hydatid disease. Am J Trop Med Hyg. 2008;79(1):84-8. doi: 10.4269/ajtmh.2008.79.84. [PubMed: 18606768]. [PubMed Central: PMC2621271]. 10. Csotye J, Sisak K, Bardocz L, Toth K. Pathological femoral neck fracture caused by an echinococcus cyst of the vastus lateralis-case report. BMC Infect Dis. 2011;11:103. doi: 10.1186/1471-2334-11-103. [PubMed: 21510859]. [PubMed Central: PMC3095994].